It's never too late to try something new. 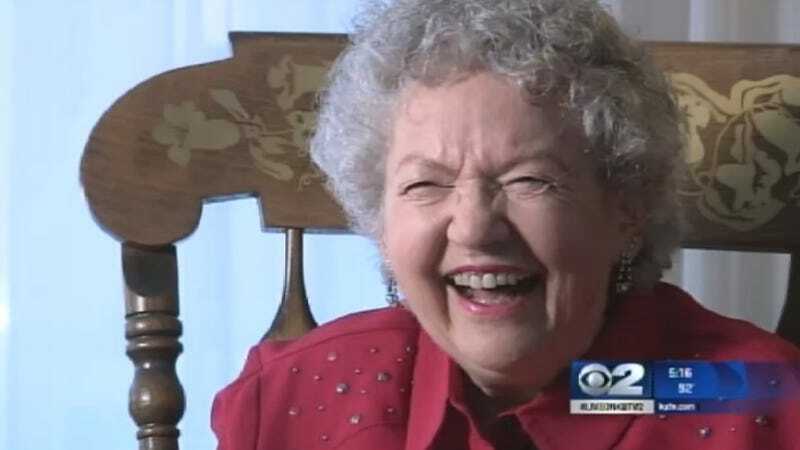 Look to the example of 86-year-old Salt Lake City woman Georgia Gorringe, who just self-published a steamy romance about a "bored housewife" and a talk-radio host, after she spent five years working on it. According to KUTV (h/t AP), Gorringe published No Good-Bye earlier this year, under the pen name Georgie Marie. "It's about a bored housewife, and she listens to talk radio," she explained. "And that voice on the radio, oh, he had a magic voice! And it just turned her on!" Apparently the contents were enough to scandalize her daughter: "Sometimes I'm like, mother, how could you do that? How can you write that?" Hey, how did you think she got to be a mom in the first place? The video is well worth watching, btw, just for Gorringe's unflappability in the face of everyone else's sliiiiight discomfort. Sometimes, the sound of a voice is all it takes to dial up a fine romance. But can you really fall in love with someone when you have never been in the same room? No Good-Bye by Georgie Marie is the enthralling modern romance that may just prove that love can happen anywhere, even on the airwaves. No Good-Bye by Georgie Marie tells the story of forty-something Gloria. An attractive woman with a passion for astrology and a domineering handyman husband, Gloria has found a romantic diversion she indulges in right in front of her husband. She simply tunes into talk radio show on the station KXYZ, and listens to the dulcet tones of the host Dr. Ben Carpenter. However, as the weeks go by, the temptation mounts, and Gloria finds herself dialing in, writing in, and entertaining an in-person liaison with the disassociated voice. What ensues is excitement, anticipation, rejection, and the entire swirl of emotions that come with any love affair. But when things become complicated, is it too late for Gloria to simply change the station? Find out in No Good-Bye by Georgie Marie. Sample text: "Gloria never told Dr. Ben that hearing his voice made her knees go weak and quiver. It was almost orgasmic!" Gorringe refused to divulge if the book was based on anyone in particular: "I can't tell on people. It's all fiction." I hope it's not Rush Limbaugh.